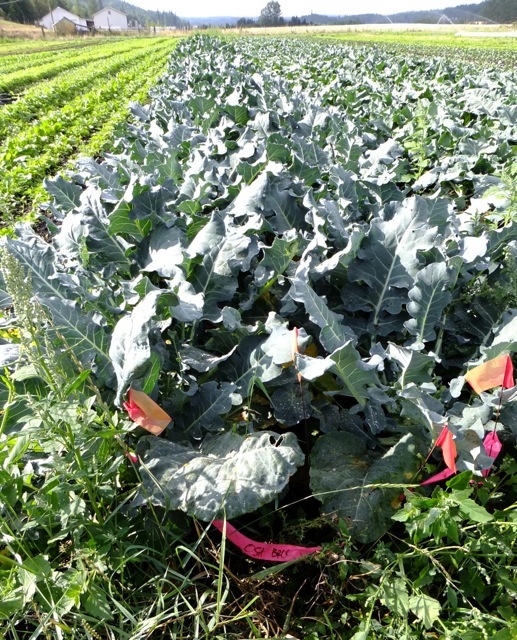 On Friday I helped Tinker Cavallero collect research data on broccoli variety trials for Organic Seed Alliance (OSA). Farmers and researchers across the northern US states are testing open-pollinated varieties that are selected to thrive with organic systems rather than relying on standard hybrid seeds dependent on industrial farming systems. Organic markets call for crops with superior flavor and high nutrition that can thrive with low-input fertility under pressure from pests and weed completion. For the last four years Tinker has been a field manager collaborating with local farmers, overseeing interns, and running the trials. Her work involves examining plants for key traits and recording the data as part of a wider effort called Northern Organic Vegetable Improvement Collaborative (NOVIC). She works closely with OSA staff scientists as they engage with farmers in an innovative participatory plant-breeding program. When most of us think of open-pollinated (OP) seed we think of heirlooms, or classic vegetable varieties that have been passed down for generations, contributing to biodiversity and our shared cultural history. You may be familiar with or even may be a member of Seed Savers Exchange, an organization of gardeners and farmers that preserves and distributes seed of endangered food crops. Saving seed is a matter of maintaining the genetic character of a crop, however the variety trial program I worked with on Friday concerns breeding new types of seed. Until recently, almost all commercial, vegetable-crop breeding was geared to hybrid seed used for conventional production that relies on chemical fertilizers and pesticides. Multinational companies that sell hybrid seeds often funded the research. Since hybrids result from crossing two separate parent lines, they will not produce viable seed that has the same traits of either parent. These hybrids are called F1 meaning they are the first generation after a cross. Seed breeding is a time consuming and not always profitable endeavor. Because only a few giant agrochemical companies own most seed they choose what is available. Based on the named crop varieties that are no longer available, the UN’s FAO estimates that 75% of crop biodiversity has been lost. Now demands are finally changing and the market for organic, open-pollinated seed is expanding. Ten years ago, when Organic Seed Alliance (OSA) began, organic plant breeding programs were almost unheard of. Now, the organization has nurtured an alliance among the scientific community. The USDA-funded NOVIC project is a collaboration including OSA, several universities, and many farmers working together to breed organic seed. The NOVIC website explains why the group is breeding broccoli and describes the plan. Dr. John Navazio, senior scientist at Organic Seed Alliance says the organization is breeding “heirlooms of tomorrow.” For organic market gardeners and truck farmers, this means vegetables that produce well under variable field conditions, including climate change. Farmers can save the open pollinated seed and regrow it every year. Also, organic food certifiers now require farmers to make a strong effort to use organic seed. Tinker has been monitoring organic broccoli varieties on several farms here on the Olympic Peninsula. Friday we examined field trials at two Chimacum farms, Red Dog and Finn River. She told me that these trials were offspring from plants created by crossing six F1 hybrids and 17 Oregon State University inbred selections, followed by several more generations and populations selected by farmer breeders. It is amazing to think about how much time and consideration is needed to create a new variety! 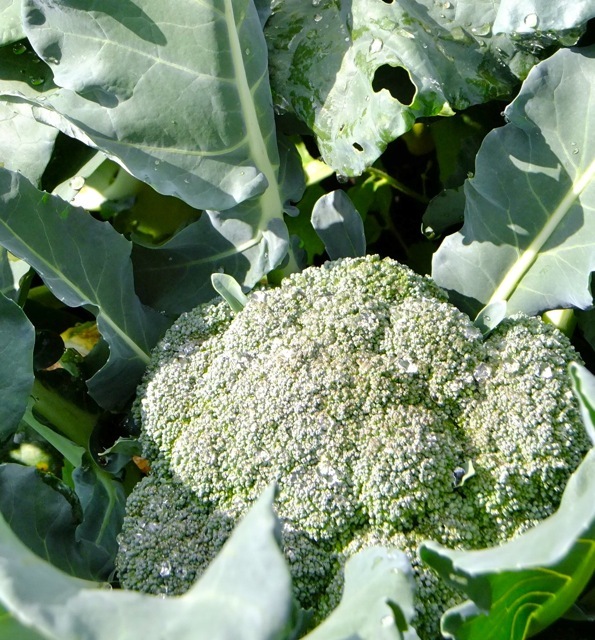 Thirteen broccoli varieties are being tested for their ability to withstand summer heat and for ease of harvest. The new OSU selections had matured about 10 days earlier and had already been harvested and rated by the time I visited the trial plots. On Friday, Tinker collected some of the last data for this year’s trial. The varieties that were now mature were the original hybrids: Arcadia, Belstar, Bay Farm, Marathon, and Windsor. First we walked through each trial plot and counted the number of broccoli plants that were immature, prime, (or ripe), and overripe. We measured and recorded a number of criteria including head size, head height, and canopy height. The last two will be used for selecting taller plants that require less bending for hand harvesting. An exerted head—one that rises above the foliage—reduces the need for trimming while harvesting. Trimming ease refers to the number of leaves that must be removed from a six-inch stem. Tinker confidently determined this as she harvested each of the five samples per plot. As we moved back and forth in the plots we noted disease and insect pest damage. One goal for the breeding program is to select plants that are more resistant to pest problems. We determined regrowth potential by checking for bud development in the leaf nodes. Market gardeners can harvest another, smaller crop by cutting these side shoots. Each of the five varieties was rated for head firmness, bead size, and head color. Note cut stem and strong new shoots. Looking carefully at each broccoli plant was like botanizing, or better yet, it was like collecting flowers for fresh flower bouquets. Broccoli of course is a head of immature flower buds. Each one is known as a bead. The horticultural term for each branched stem that makes up a head is floret. Depending on the weather, an immature head two-inches in diameter can expand to five inches in a few days. In the cool of spring and fall it can take much longer. A head can be large but still immature. I have harvested broccoli years ago on my own farm in Missouri and more recently doing work trades on CSA farms, so I thought I was qualified to choose ripe broccoli, but looking at heads of different varieties and consciously rating them was a new experience. Also I had never noticed the different ways heat stress can manifest in broccoli. 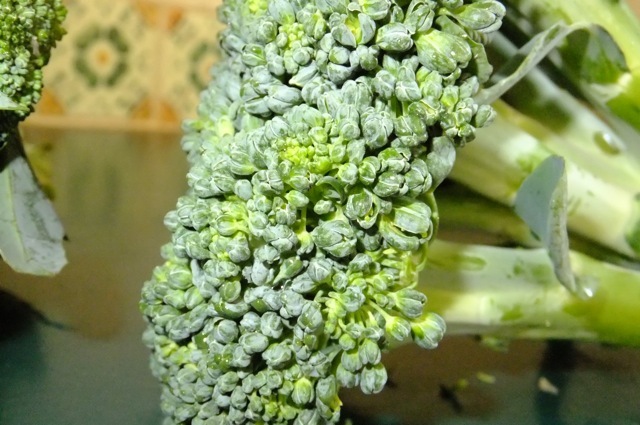 Broccoli of course is a head of immature flower buds, known as Unopened buds are called beads. Each head is made up of stems called florets. Tinker has a razor-sharp memory and has honed her observation skills during 40 years of farming and gardening. She showed me the subtle differences between over ripeness and heat stress. Although some varieties mature with a flat head or compact dome, several varieties have bumpy heads when they are fully ripe or prime. 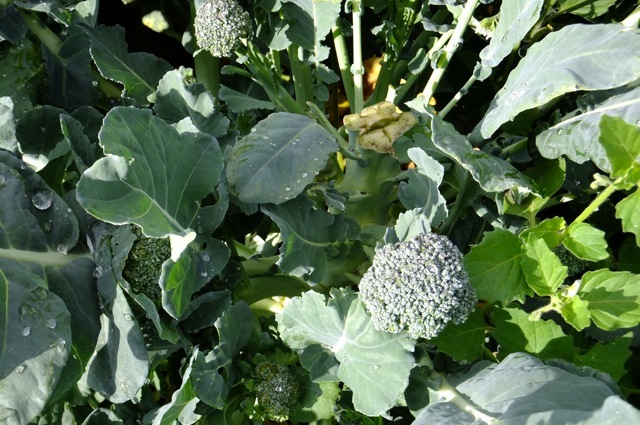 Typically broccoli heads differentiate, or start to show signs of separate florets, when they are overripe and ready to flower. Gypsy variety responded to heat stress by sprouting leaves in the middle of the head. Another sign of heat stress is starring or resetting, indicated by an undeveloped center bead of a floret compared to outer beads. Color is another trait in the selection process. Dark green or green with a slight purple tinge is most desirable and gets the highest rating while medium or pale green have a low rating. I knew purple broccoli existed but Tinker explained that a purple tinge is part of the complex genetics of Brassica oleracea, the botanical name for broccoli and other cole crops. Apparently there is a whole spectrum with some varieties having more anthocyanin, a purple pigment. The heads are weighed and noted. Then Tinker went to the office and entered the data that will be used to rate the open-pollinated varieties. 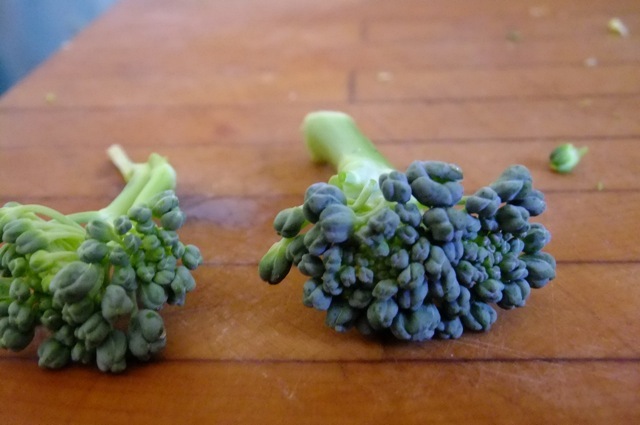 Mature broccoli on right has dark green color. Uneven beads are caused by heat stress. Many years of research go into developing a new crop variety. Breeding open-pollinated varieties for use with organic systems is turning the tide from corporate-dominated patented hybrid seed to providing seed that everyone can use and save. The old paradigm makes farmers dependent on a handful of seed corporations that gear plant breeding to crops that perform with high levels of chemical fertilizer and pesticide. The goal of NOVIC is to identify the best performing existing varieties for organic agriculture, and educate farmers on organic seed production and plant variety improvement. Tinker recognizes the importance of working closely with the farmers who will use the seed. She is an astute farmer who brings many years of direct experience to meet the challenges of variety trials. The website http://eorganic.info/novic/broccoli explains why the group is breeding broccoli and describes the plan. Here are several suggestions for keeping garden records. They are useful tools for planning the garden including permanent plantings, crop rotation, and seed saving. This is a sample from the seed saving curriculum I developed for Organic Seed Alliance. Description: Gardeners and farmers map their home garden or field site as the first step toward systematic garden planning. Objective: Create an accurate map of garden or field as a base plan for graphically planning garden activities: annual planting plan, crop rotation and seed saving. Camera for photographing the baseline or landmarks, and shooting the same site from different angles. Compass for determining north, aligning the map correctly, and determining an initial understanding of the Sun’s arc across the sky. General gardening concerns: crop rotation, green manure or cover crop, succession planting. Identifying plantings of crop varieties that have lost their label. Establishing beds with permanent isolation tents. Maps work in tandem with garden journals. Planning isolation distances for growing seed crops by determining if the site provides sufficient distance or if you need to plant adjacent edible or flowering crops as physical barriers to the spread of pollen. Preparation: Regional gardening clubs, master gardeners, or seed libraries might invest in these tools and offering them in a lending capacity. Start with one location and label that A. Measure A to next landmark (tree, building, or water faucet) mark B, record distance. Then A to another point labeled C, measure and record distance. B to C. Measure and record distance. Once a point is anchored by triangulation, go on to connect to next feature, once again using triangulation. This is particularly useful in determining relative positions of trees and other free standing landmarks on the property in relationship to the garden, field or growing site. Draw an approximation. Indoors use the 24 inch by 36 inch page and architect’s scale to accurately record everything. Use pencil and eraser. Use triangles or straight edges to keep lines clean and accurate. The roots of heirloom seed companies can be traced from the mid-1800s when seeds were part of the public trust, to the disappearance of family-owned seed businesses in the 1970s, to the renaissance of heirloom and organic seed companies today. An article in Acres USA, “Seeds of Sustainability”, by Bill McDorman, author, and founder of two seed companies, and Stephen Thomas, provide not only a historic overview, but also, offer provocative thoughts about where the market is headed. Over 50 small and family-owned companies were acquired by multinational conglomerates after the Plant Variety Protection Act included seeds as intellectual property that could be privately owned in 1970. Ten years later, a supreme court ruled that patenting life-forms based on their genetic code could legally be privately owned. Seed company mergers and buyouts followed until there were few regional, independent companies left. Major seed companies choose to focus on breeding new high-yielding hybrids. The major drawback of hybrid seed is that its progeny are unpredictable, requiring farmers to purchase seed each year. Seed companies dropped countless old fashioned, open-pollinated varieties that could be saved and focused on traits that benefited agribusiness, uniformity maturity, toughness to withstand shipping and long shelf life. These varieties thrived when grown with heavy chemical inputs. The gap in the marketplace created a niche for the germination of small, independent seed companies and non-profit organizations in the 1980s. Bountiful Gardens had its start at this time, as did, Seed Saver’s Exchange, Johnny’s, Territorial, Garden City Seeds, and many others. These small, independent companies were alike in being started by visionaries with commitment to maintaining seed diversity while they differed in their mission of who they served. The emerging seed businesses branched at this juncture: some focused on preserving a wide array of open-pollinated and heirloom seeds and making them available to as many people as possible. Some seed companies targeted primarily market gardeners and small-scale farmers. While providing open-pollinated seeds, they also offered hybrids and several of the more savvy entrepreneurs even cultivated trial gardens to introduce new sustainable varieties. Other companies targeted home gardeners and homesteaders; they kept a low overhead, stayed small and choose not to promote their products through glossy catalogs. Some choose to keep their prices down while others were trendsetters. The seed industry’s next growth spurt came in the 1990s, prompted in part by the National Organic Program (NOP) requirement for certified organic growers to buy certified organic seed, when available. Tom Stearns, founder of High Mowing Seed Company, has been written up in “Seeds of Success” by Cheryl Cesario, also in the January 2011 issue of Acres U.S.A. Although a highly informative piece about a leader in the field, it is beyond the scope of this article. While the NOP requirement for organic seed is hailed as an incentive to banish chemicals from organic farming, some growers are concerned that the rush to procure organic seed must not be at the cost of losing more heirloom diversity. The challenges to offering organic seed are as follows, the seed companies face higher production costs, added expense of certification for organic handling, and reluctant farmers. The organic farmers and market gardeners in turn are confronted with inadequate seed supply, greater expense for seed and the risk of growing untested varieties when their livelihood and reputation are at stake. What many people seem to be acknowledged is that open-pollinated, organic varieties hold a promise for us to adapt to an increasingly unpredictable climate. As a culture we can’t expect the farmers and seed companies to take all the risks. Some see the need for the government in the form of the land grant colleges to usher in the transition. Organizations like the Organic Seed Alliance are actively working toward breeding what they call “heirlooms of tomorrow”. Some people suggest that the successful organic foods industry help fund the transition. Finally, it may come down to individuals who step forward to make the commitment to saving and breeding their own seed. Dr. Vandana Shiva, highly articulate ecofeminist, author of numerous books including Soil Not Oil: Environmental Justice in an Age of Climate Crisis, challenges the false claims of a current advertisement by Monsanto. 9 billion people to feed. A changing climate. Now what? Producing more, conserving more, improving farmers’ lives. That’s sustainable agriculture. and that’s what Monsanto is all about. A Changing Climate: Industrial globalized agriculture is heavily implicated in climate change by contributing to the three major greenhouse gases, carbon dioxide, nitrogen oxide and methane. Vandana Shiva quotes the specific increases from pre-industrial times to now, according to the Intergovernmental Panel on Climate Change. Conserving More: Contrary to their claims, the GMO industry is stealing, not conserving genetic information. Navdanya’s recent report titled, “Biopiracy of Climate Resilient Crops: Gene Giants are Stealing Farmers’ Innovation of Drought Resistant, Flood Resistant and Salt Resistant Varieties,” shows that farmers have long ago bred corps that are resistant to climate extremes. The industry claims of isolating a “drought tolerant” gene are also unfounded. Vandana counters, “Drought tolerance is a polygenetic trait. It is therefore scientifically flawed to talk of ‘isolating a gene for drought tolerance.’ Genetic engineering tools are so far only able to transfer single gene traits. That is why in twenty years only two single gene traits for herbicide resistance and Bt. toxin have been commercialized through genetic engineering. Furthermore, genetic engineering leads to soil carbon reduction when crops are herbicide resistant. Weeds are sprayed instead of turned under the soil or composted, thus soil carbon is reduced, not conserved. Improving life for farmers: The painful fact of 200,000 Indian farmers committing suicide in the last decade is linked to debt created by the high cost of GMO cotton seed. Shiva provides statistics and compares prices.